Anyway, I reached for my phone (and the cuppa my lovely DH always brings me to drink before I lurch out of bed to start another day) and did the rounds - you know, emails, Facebook, Twitter, bank account.... What? That's just me? Oh. Well anyway. 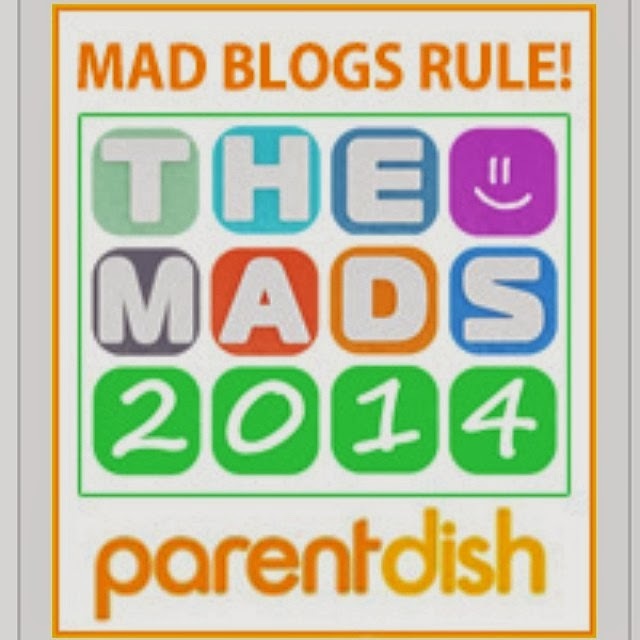 On Facebook Katherine from mummypinkwellies had posted that today nominations are open for the Mads - the #madblogawards sponsored by parentdish. She asked who felt excited. Hmmm. I am - but why? I examined this side of my personality - why do I feel the desire to be nominated and feel like winning an award would be a real life-time achievement? After all I've heard it said many times we should be blogging for ourselves and ourselves only and if other people enjoy it too, well that's a bonus. I do write for myself (the madness in my head has to have an outlet somewhere) and even when I'm writing sponsored posts I do my best to be true to myself. I heard a great tip once - check your blog still sounds like you. I do this and 99.9% of the time I believe that it does. I am inordinately proud of my own blog so why isn't that enough? I have nominated myself a couple of times, and have been nominated by loving friends who are as always supported. But I can't help hoping that this time someone I've never met loves my humble blog so much they want to reward my "talent" and nominate me. And the award for "best blog written in pyjamas" goes to.. I sense that as always I will leave begging messages and badly disguised hints on my social networks and this blog and hopefully eventually one of my friends or a member of my family will give me a "pity nom". If they don't have to register with whatever site is running the awards that is. In fact I realise that this post sounds like that's what I'm aiming for but I did truly start writing it as a way to attempt to explore why I want to be recognised publicly so much. It's the same with the rankings and charts - we all say we don't care - and I don't as long as I'm going up! But when I drop - I have to admit I do care and it feels like a personal slight even though I know it's all down to a bunch of random algorithms and that maybe I've been barged out of the way by someone who has had a particularly successful linky that month. I think the whole thing is not exclusive to bloggers- throughout our lives all we want is to be acknowledged. We want to succeed, we want to feel loved and included. So Kathryn -yes I am excited - and if any bloggers want to get together and present me with a shiny trophy for "Best blog by a slightly dumpy fake-blonde mother of 7" I would be delighted! Aww thankyou - whoever you are! Of course we care. I don't believe anyone who says they don't. That said, I do respect those who choose to stay out of it. We are so quick to read things into the fact that we didn't win, that in some cases it's easier to stay on the periphery and watch the fun and games. By the way, I'm sorry, but I had to have a little chuckle at your fibromyalgia barricade - I am exactly the same in my bed! I know it's hard not to take things personally and to wish we could have more readers, more comments, more shiny trophies - I'm just too competitive to stay on the sidelines! I think you deserve a reward for being a mum of 7, I know people say it to me all the time and I've only a brood of 5! Anyway, like Helen said, it's natural to want to be accepted, appreciated, in the lime light, and believe me the MAD blog awards put on a boomin' fantastic 'do' So go for it girl, and I'll wish you the best of luck....maybe I'll see you there, fingers crossed.